Of the many rare star counts that can be witnessed on American Flags, 43 stars is among the rarest. Washington became the 42nd state on November 11, 1889. 42 stars would have become the official count in July 4, 1890, and for nearly 8 months following Washington's statehood, flag makers across the country manufactured 42 star flags in anticipation of it becoming official. However on July 3, 1890, just one day before 42 would have become official, Congress brought Idaho into the Union as the 43rd State, making 43 the official count on July 4, 1890. Then, just seven days later, on July 10, 1890, Wyoming achieved Statehood, and we would maintain 44 states from 1890 until the admission of Utah on January 4, 1896, nearly 6 years later. Although 43 stars remained official until July 4, 1891, flag manufacturers, both home and commercial, did not produce 43 stars in any great number, since they were obsolete almost immediately. Few were produced and even fewer have survived. Close examination of this flag shows evidence, based on the wear and craqueleur of the painted stars, that the seven small outlier white stars were painted at a later time. This means that the flag began its life during the last year of the Civil War, with 36 stars, and was updated in 1890 to 43 stars. Aside from the fact that this flag is a 43 star flag, it is exceptional on several other accounts. It is certainly unique and probably the rarest and most desirable of all 43 star flags known. The flag is made entirely of cotton and is homemade. The beautiful great star pattern is painted on both sides of the canton in white paint. 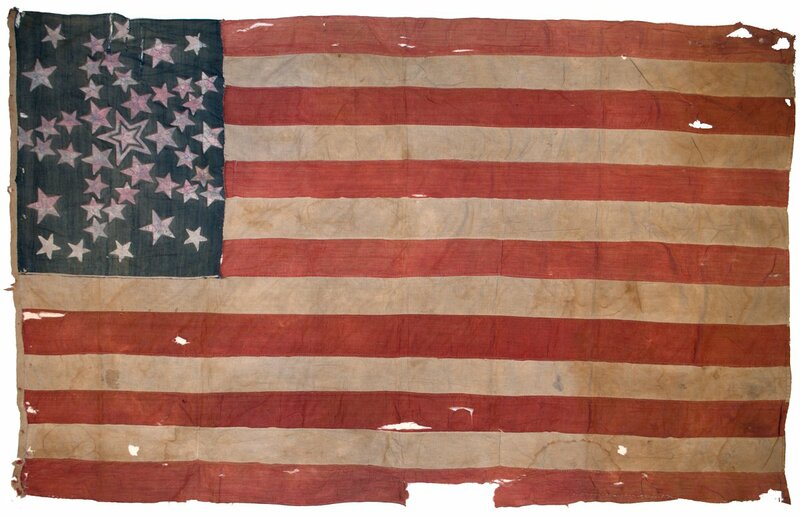 Great Star flags were popular from the 1840's through the end of the Civil War, and the last commercially manufactured Great Star patterned flags featured 38 stars. By 1890, the pattern was generally supplanted by the traditional row pattern that we know today. This is one of the latest, if not the latest, Great Star patterned flags in existence. Additionally, the extremely folky presentation of the flag, with the variable sized stars, the "halo" around the large center star, the free rotation of the stars around their axes, and the whimsical manner in which the maker inserted additional stars that would not fit in the Great Star itself, all combine to form one of the most spectacular cantons found on any American Flag of any period. Learn more about the Grand Luminary pattern.